Castelnaudary, located deep in the south of Languedoc-Roussillon, is an interesting small town. Many boats cruising along the Canal Du Midi moor on the town's banks overnight, perhaps to sample some of its cuisine for which it is famous. Make sure you don't miss its cassoulet, in particular, as it considers itself the world's cassoulet capital. It's a thick stew made from haricot, beans, sausages, mutton and goose. 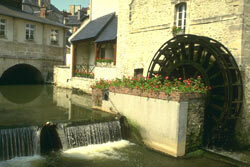 The town was once strongly dependent on its flour milling industry. Perched on a hill overlooking the plains of Languedoc, you can find the beautifully restored Moulin de Cugarel. Active in the 17th century, it has now become a surprisingly unique building of interest. There are a number of fabulous sites to explore in the region. If you fancy getting wet, then you'll be pleased to know that a relaxing dip in the Mediterranean Sea is not too far away. If, however, you prefer history and magic, then head South-East to Carcassonne, a magnificent medieval town that has an inspirational castle. Travelling by air is relatively easy as a number of cheap airlines fly into Carcassonne. If you don't fancy flying then you could always travel straight across France. To avoid making the long journey yourself, why not take the TGV train service to Montpellier? Hire cars can easily be rented out before or upon your arrival. As a rule, Languedoc-Roussillon is an expensive place to buy property in France due its great climate and wide array of activities (although, compared to the Riviera and the Provence, the area is still cheap). Castelnaudary and the Aude department are not overly expensive, however, prices are certainly on the rise and the number of bargains to be found are diminishing. Do you know Castelnaudary better than we do? Do you have photos of Castelnaudary? Castelnaudary is located in the north west of the Languedoc Roussillon in the Aude region. It is around 10km from the department capital, Carcassonne. Access: Carcassonne's airport is just a few kilometres from the town and has regular flights to and from the UK. Economy: After centuries of dependance upon the flour mill industry, business is now quite diverse. Interesting fact: Castelnaudary believes that its cassoulets are the best in the world. Of course, there's only one way to find out..